Just the other day I was asked for the definition of customer service. In the context of our conversation I stated that it was the way the customer is treated by anyone in the company before, during and after the sale. Then, just for fun, I did a Google search on “The definition of customer service.” There were quite a few answers, as you could imagine. So, for even more fun, I tweeted the following: Writing an article and thought to “Tweet Source” some research: What’s your definition of customer service? Al Hopper defined customer service as “the assistance and advice provided by a company to those people who buy or use its products or services.” Support and assistance, managed well, is great value differentiator between you and your competitors. Retail Wire said it’s “not having to ask someone for help.” I like that. Short and sweet. Deliver the service before the customer asks for it. Dr. Meghan Norris suggested that “having the flexibility and power to adapt to, and meet, consumer wants and needs in the specific context.” For me, the key words are flexibility and power, suggesting that employees are empowered to ensure the customer is happy. Corporate Dynamics chimed in by suggesting that customer service is “a selfless desire to fulfill the needs of your consumer and community.” The phrase “selfless desire” is interesting. Customer service is all about the customer. Lisa Catalano said that customer service is about “recognizing and addressing needs, whether solving a problem or advising why it can’t be solved, with respect and sincerity, quickly.” Lisa is emphasizing that we must react quickly to customer’s needs and problems. Jack Dillon chimed in with “being served to meet my expectations. Building a team that comes in loving to service, knowing to work together for the customer and the business.” If a company can always meet my expectations, they will most likely exceed my expectations. It’s hard to be consistent, but the companies who are, tend to be the ones that customers want to come back to over and over again. They like the predictable experience. Okay, here is a twist. Not to diminish the awesomeness of these definitions, but the reality of all of these definitions, mine included, don’t really count. I’ve written about this before, and it is worth sharing this comment again. Regardless of how good these definitions are (and they are good), in the end it’s the customer’s definition that counts. 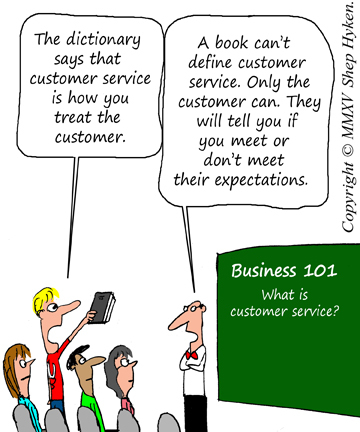 The customer defines what service means to him or her. The customer’s definition, in most cases, becomes the expectation, and it is up to the company – and the people in the company – to not just meet but exceed that expectation.